Being an ongoing-learning "apprentice" to bread baking, adding caraway in bread seems like "new" idea to me. Caraway seeds have an anise-like flavor with a little minty aroma and the addition of these seeds has indeed spice up the taste of a typical rye bread. 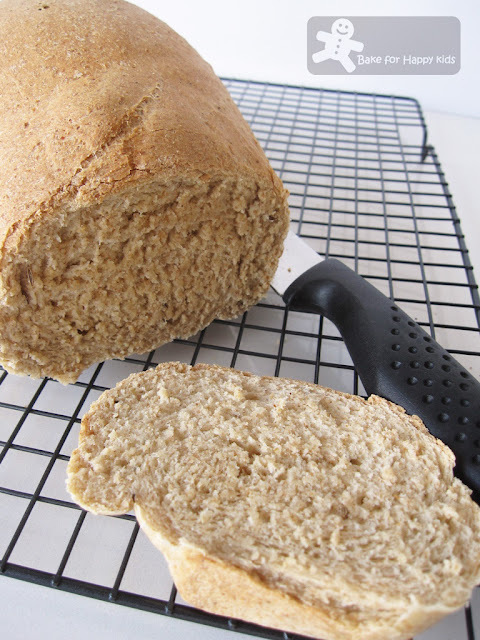 This rye bread is best served with a bowl of hearty soup. Yum! Add water, lemon juice, and oil to the bread pan. Sprinkle over rye flour and bread flour, ensuring they cover the water. Add milk powder and caraway seeds. Add the salt and sugar in separate corners of the bread pan. Make a small indent in the center of the flour and add the yeast. Set the bread machine to basic setting. Press Start. Remove the bread at the end of the cycle and transfer to a wire rack to cool. Note: Instead of using the basic setting, I used the dough setting to bake this loaf. After cycle finished, I punched down the dough, shaped it into a loaf-shape and placed it in a 10 x 20 cm loaf and let it rise for another 1 hr. The bread was baked at 180°C fan forced for 30 min or until the bread sounded hollow when tapped. Allow to cool for 10-15 minutes and serve warm. Ooo...you've just reminded me of my packet of rye flour still hanging around the pantry. haha... Must use them up! Your bread sounds healthy & wonderful. That looks like a very hearty bread and would be so delicious for dipping into curry gravy too...yummy! What a beautiful loaf of bread. This is gorgeous, Zoe! Thank you for stopping by my blog. I really love rye, but it's not a common ingredient in Spain and need to go to a Scandinavian grocery to get it here. Mmm, there's just nothing like a fresh loaf of bread. I could munch on that all day. Wow! Perfect & delicious bread, looks awesome. Your bread looks wonderful, yes, it would be lovely with a bowl of hot soup, we love mushroom soup to go with bread like this! Will have to give this a try too! Your loaf of breaD sound healthy and good. oh yum, I've been thinking about baking with rye lately, and you've confirmed that it does make great looking loaves! I bet the bread tasted awesome with soup! always love the crust of your breads! havent tried with caraway seeds before, it's time soon for me to try out some new flavours! Ack! Soup is that last thing I want right now. However, this bread on the other hand... Yum! I can only imagine how gorgeous your house smelt when this lovely loaf was cooking - the addition of rye is wonderful! 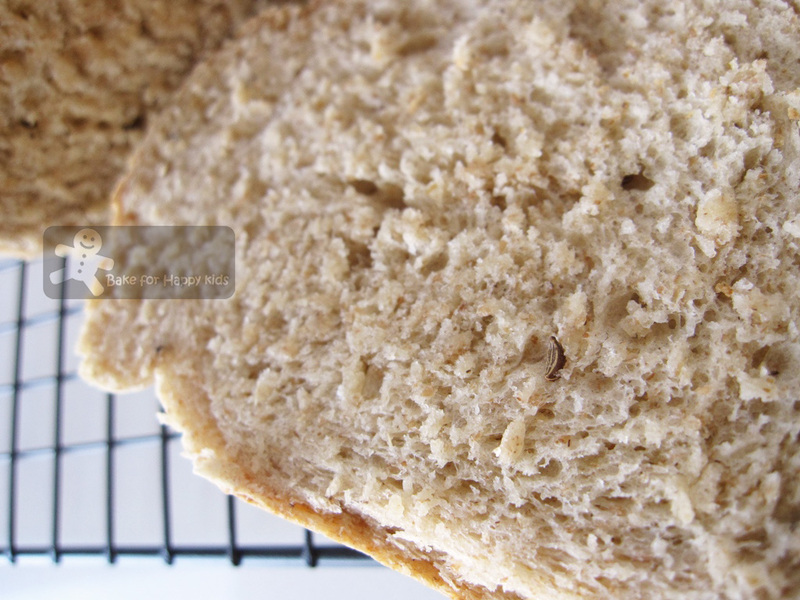 OH one of my favourite breads, I have a German Rye and Caraway bread recipe and I love it! Yours looks superb, so light too.......need to save that for the soup season! Spectacular bread and I think the addition of caraway seeds is pretty brilliant. I bet it smells heavenly! Oooo, this looks delicious! I love rye bread and with the caraway I'll bet it's so flavorful! Hi I baked this bread, it turn out so yummy! But the texture turn hard next day? is it right? not sure why? I omit caraway seeds, not sure where to purchase, and add in sun-dried tomato. Thank you for your advice and sharing. Soh: The caraway seeds are easily available from our local supermarket at Melbourne. For my bake, we ate half of this loaf for our lunch and I had kept the other half in the freezer for one of my husband's weekday lunch. He will usually toast his bread and top the leftover bread with can tuna and cheese. I didn't hear him complaining about this lunch and I'm assuming the bread is still good when he ate the leftover. Did you keep the bread in a container? That will help to keep the moisture of this bread. Hi Zoe, thank you for your reply, I did keep the bread in a container, not sure is it got to do with S'pore weather? I will try again. Hi Zoe, Thank you for all the advice. I was thinking can I prepared the dough in the night, shape and let the dough proof for 2nd time, and place it in fridge, will bake next morning, the bread take 30 min baking time not too long. Can I bake the dough once take out from fridge, or must let it place in room temp? thank you for your advice. I have a book, Artisan Bread in 5 min a Day by Jeff Hertzberg and Zoë François which suggests the same concept of bread baking that you mentioned. In order to have fresh breads everyday with minimal fuss, this book suggests a preparation of a large amount of bread dough, prove them for 2 hrs and store them in the fridge for up to 2 weeks. Every-time when a loaf is required, a portion of the dough is removed from the fridge and allow it to proof for the 2nd time (which is about 2 hrs, longer than usual and this is to allow the yeast to adjust to room temperature) before baking. I've tried baking one of loaves from this book and find that the dough is very sticky due to its higher water content. The book did explained that the dough has to be high in water content as it will dry out during the storage and would not suggest any alterations. I would suggest using other bread recipe instead of this one if you are going to store the bread dough overnight. Happy fun baking!